Brace Yourself. 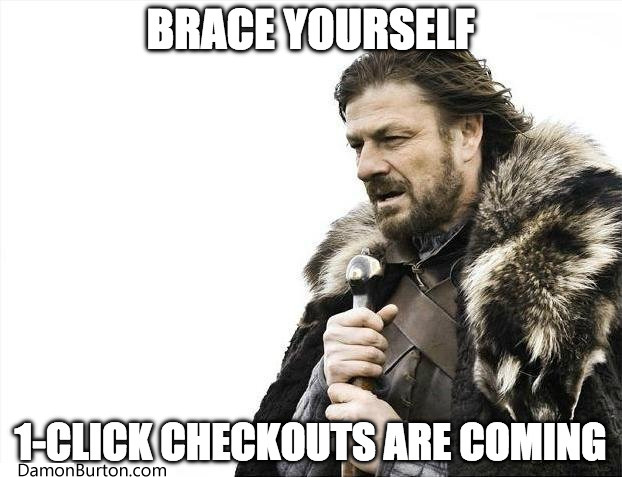 1-Click Checkouts Are Coming. Amazon’s 1-Click patent expired on September 11, 2017. Online shoppers can now expect tech titans such as Google, Microsoft, and Facebook to create internet-wide one-click ordering features across websites. 1-Click is an online purchasing technique that allows customers to purchase using a single click. The buyer will enter the payment information only once, during his first purchase, and the succeeding purchases can use the stored information. The 1-Click makes repeated shopping easy because the shopper need not enter their payment and shipping information for every purchase on each new visit. Convenience at its best = increased conversions = sales. Amazon, a pioneer in online shopping, filed the patent for 1-Click functionality in 1997, long before online shopping became popular among consumers. The US Patent Office granted the patent in 1999, providing protection, in broad terms, to e-commerce transaction executed with one-click using stored customer credentials for validation. Amazon filed for the patent during a time when consumers were highly reluctant to enter financial information online. The functionality that required consumers to enter their financial information only once became a confidence booster for many consumers, who felt at ease and secure for not having to enter financial data each purchase. The result of this innovative drove high conversion rates for Amazon within its existing customer base. Since the payment and shipping information of each customer is already safely stored on Amazon’s servers, the checkout process became seamless and frictionless. When Amazon originally patented 1-Click technology, it was still an online bookstore. Rival Barnes & Noble offered the same technology, which they called “Express Lane.” Amazon filed an infringement lawsuit against Barnes & Noble and won a court injunction. Apple, a tech giant, decided to apply for licensing rights from Amazon instead of fighting the patent. Apple incorporated the frictionless checkout into iTunes, the App Store, and iPhoto. Such patent licenses drove big passive revenue for Amazon. Everybody can expect online retailers to capitalize on the expiration of the patent. This is great news. In the near future, expect 1-Click-like payment system to be a universal payment feature across websites.